Sick to my stomach after last night's debate. Smarmy, condescending, petulant, rude. Any other Romney adjectives come to mind? 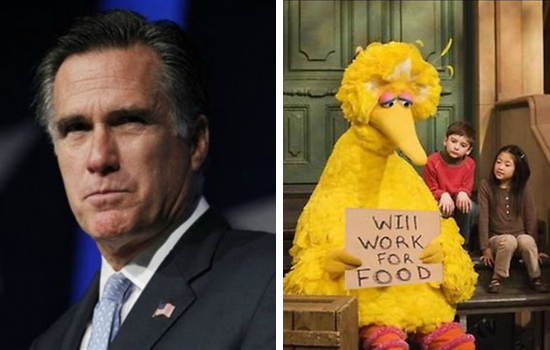 And, seriously — dude should know better than to attack Big Bird. My sisters and I grew up on South Dakota Public Television. We were enraptured by Rodgers and Hammerstein's "Oklahoma!" during pledge drives. I am so grateful that my parents modeled true "family values" by donating to intelligent, progressive causes like PBS. The arts matter. They should be funded. No more of this elitist tax break crap and military waste at the expense of culture, conversation, and populist media. These next several debates should be hot ones. I hope Obama comes back ready to rumble.